In this Encounter students investigate and compare aspects of other artworks to The Dinner Party. 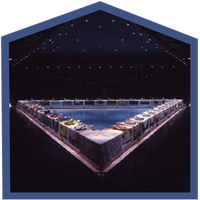 They consider Judy Chicago’s early and later works, and artworks by other artists that connect to the The Dinner Party through various ideas and themes. Students consider artworks that make social statements and promote change, or artworks that focus on such themes as women in history, gender issues, and identity. Students are led through a series of interpretation and comparison activities with artworks selected for their potential to shed light on The Dinner Party. Art can inform other art. Deeper understanding of The Dinner Party emerges when students clearly understand what the artwork is and is not. Consideration of The Dinner Party in the context of other artworks with similar ideas and themes will help students deepen their understanding and appreciation of Chicago’s work, while they develop a broader understanding of some potential purposes and the possible social impact of artworks over time. By making connections to current feminist voices in contemporary artworks, students should further appreciate the voice and message within The Dinner Party. To view the entire Encounter, download the PDF for Encounter 12: Constructing Interpretations by clicking on the buttons below.